My friends and I had been trying to find a day when the three of us could all go to see the new remake of A Star Is Born, but it took us three weeks to get our schedules (and the stars) aligned. It was worth the wait. Though I expected to like it, this powerful movie - and its music - just blew me away. 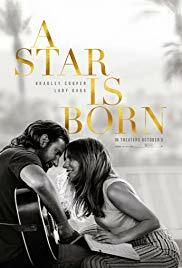 As I'm sure you've heard by now, Bradley Cooper and Lady Gaga are the stars in this version, in the roles most recently played in 1976 by Kris Kristofferson and Barbra Streisand. Cooper plays Jack, a rock country music star slightly past his prime who still brings in massive crowds. Gaga stars as Ally, a down-to-earth waitress who dreams of being a star, though she's been told by many people in the music business that she doesn't have the looks for it. In the opening scenes, she sings at open mic night among drag queens in a dive bar. Cooper, an alcoholic always looking for another drink, happens to spot the tiny bar on his way home from a concert and asks his driver to pull over. Wowed by Ally's singing, he chats with her afterward in the dressing room and then takes her out. There is awesome chemistry between the two of them immediately, as they talk about music and life, and it's clear that Jack is smitten. He pulls Ally into his world and literally pulls her onstage with him at a huge concert, where they sing a duet of one of her original songs that she's always been too shy to sing in public. That appearance becomes a viral hit, and Ally is off and running, soon with her own manager and producer, while her limo driver father and his friends cheer her on. At first, its bliss for the two singers, making music together and falling in love, but Cooper's alcoholism begins to get in the way, and his condition steadily worsens as her star rises. I never saw any of the earlier versions of A Star Is Born (crazy, right? ), so I went into this knowing almost nothing about it, though I've heard that this version does not follow the exact same plot as earlier films. I expected to be entertained by the music, but there is so much emotional depth to the story. Cooper and Gaga are both extraordinary in their roles (definite Oscar contenders), inhabiting their characters so completely that I felt as if they were those people, which is quite a feat for two such well-known stars. The supporting cast is equally good, with Sam Elliot as Jack's manager, a surprising Andrew Dice Clay as Ally's dad, and Dave Chappelle as Jack's oldest friend, among others. And the music? Wow, just wow. Of course, Lady Gaga is an extraordinary singer but here she is stripped of her usual outrageous costumes and gimmicks and her raw talent is amazing. And who knew Bradley Cooper could sing? He's actually quite good and totally believable in this role. The original songs created for the movie (mostly written by Gaga) are not the kind of throw-aways you'd expect for "fake hits" in a movie; they are moving, powerful songs. The day after I saw the movie, I listened to some of the songs on Youtube and got chills down my spine all over again. The plot of the movie was darker than I expected, but it is so full of honest feeling that I was swept along. The highs are super high, and the lows are really low. This is a must-see and definitely worth seeing on the big screen for the musical performances. A Star Is Born is currently in theaters (but probably not for much longer) - find a recliner theater near you, like we did! Sue, what a terrific review. I so loved this (and the recliner seats) that I saw it twice and bought the sound track. Glad you liked it, too! I'm going to get the soundtrack, too. Shallow has been going through my head for days!